Reset your Roost device – How can we help? If your Roost device has missed a check-in in the Roost cloud or you need to set up your device again, you may need to reset it. If your device is already set up and connected to your Wi-Fi network, you do not need to set it up again after you reset it. It will remember your Wi-Fi name and password. Please see below instructions on how to reset each Roost Smart device. To set up your Leak detector, it must be in set up mode. If you do not see the blinking green LED on the top cover, you will need to re-set your detector. To re-set the NEW Roost Leak detector (model RSW-200B), press the ¼” diameter circle with a blue ring around it on the bottom of your device until you hear a click. Release the button, wait a few seconds, and you should hear a beep. Your device is now in set up mode. To re-set original Roost leak detectors (RSW-200 or RSA-200A), follow the instructions below. Carefully open the device by separating the top and bottom covers at the blue line that encircles the device. Remove the AAA batteries and wait 10 seconds. Replace the batteries in the device, ensuring that they are placed properly matching the + and the – stamped in the blue plastic of the battery compartment with the + and – on the batteries. You should hear a single beep and you can now replace the bottom cover. If you do not hear a single beep, but see the green LED blinking, try to go through the normal setup process in the Roost app as if the beep had sounded. If the green LED is not blinking, then you will not be able to set up your device. To re-set your Roost Garage Door sensor, you will need to remove it from the blue clip that it is encased in. Gently ease the clip open on the left side where the clip protrudes slightly and slide the sensor out. NOTE: If your sensor has already been installed onto your garage door, please ensure that you close your garage door behind you before removing the sensor from the clip. Remove the bottom smart module (the small rectangular piece at the bottom of the battery below the blue line), wait 5-10 seconds and replace it. After another couple of seconds, you will hear a single beep from the sensor. An LED on the short edge of the smart module will blink red for 10 minutes after re-set. This indicates that the sensor is in set up mode and will not check in with the Roost cloud until after it exits setup mode. To re-set your Roost Smart battery, simply remove the bottom smart module (the small rectangular piece at the bottom of the battery below the blue line), wait 5-10 seconds and replace it. You will then hear a single beep from the battery. If you have a Second Generation smart battery, an LED on the short edge of the smart module will blink red for 10 minutes after re-set. This indicates that the device is in set up mode and will not check in with the Roost cloud until after it exits setup mode. 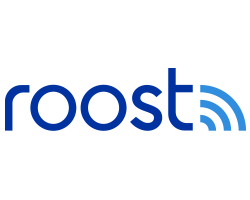 I've changed my Wi-Fi router since installing my Roost device, what should I do?